Google’s Local Services ads help businesses connect with customers searching Google for the services you offer. 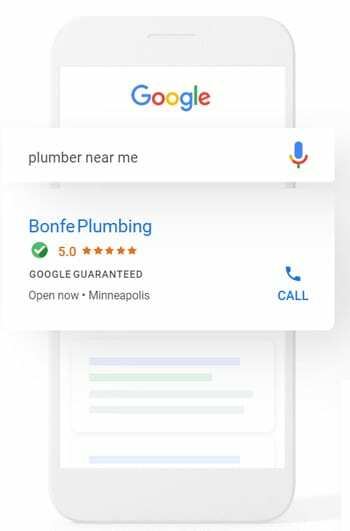 When they Search your ads will show up for customers in your service area complete with the Google Guarantee and Google Reviews Star Rating. Google LSA (Local Service Ads) make it easy for customers to call your business directly which will keep your call board full. Local Services ads appear on Google Search results, so in-market customers near you can find and contact you immediately and book appointments with your CSRs. The Best Part is You Only Pay If and When you Schedule! Another great feature of Google Local Search Ads (LSAs) is that you only pay when customers schedule appointments through your ads. This allows you to continue with ongoing SEM, SEO, Display, and outbound contact strategies only when needed. Learn how Google Local Service Ads (LSA)’s can help you generate high quality customer leads for your business! How much do Google Local Services Ads leads cost? Businesses are required to set a weekly budget to fund advertising efforts. You will only pay once a lead is generated via the LSA ad. Lead costs vary by industry but typically businesses pay between $5 – 139 for each lead for all industries that currently have Local Service Ads available to them. Home & Local Services estimates our average customer is paying around $35/lead. What Business Types Qualify for Google Local Service Ads? What Do LSA Ads Look Like? Currently Google’s Local Service Ads are not available to be run in all areas. We’ve found that many major cities and metropolitan areas seem to be the first adopters for the LSA program in the United States. Google recently announced that their LSA advertising product will be the primary marketing tool available to businesses looking to be visible in Google Voice Searches. Home & Local Services can help get you set up with Google Local Service Ads today, additionally schema mark up (standard on all of our websites) will be referenced for organic voice searches. Home and Local Services is an award-winning Local Service Ads agency and management company option. Home and Local Services wants to be your agency of choice for Local Service Ads. We have a combined over 30 years of industry and marketing specific to local businesses. We’ve helped our clients who are plumbing, heating, hvac owners find more customers in Google searches by employing our proven strategies. Please contact us to make us your Local Service Ads Agency partner. We would be delighted to hear from you!